So happy to find this service, it fills a need in the industry with PBX functionality over VOIP with any provider from and to anywhere in the world. All at affordable in-network and toll rates. Will never have to find another phone solution for my home or business, as this system moves with me effortlessly. Best small business phone platform on the market! Pros: Easy to use and easy to self manage. Big business for small price. Takes 5 minutes to get going. I was able use my own IP Phone. Need more information on their site, had a hard time accessing information on their site. Founded in 2005, this Toronto based provider offers users full featured enterprise-grade phone system solutions/services. As such, the service works as a full featured Enterprise PBX ( call forwarding, caller ID, 3-way calling, voicemail to email, etc. ), and also includes a digital receptionist (IVR), company number, an easy-to-use control panel, unlimited members and departments, toll-free/local numbers, personalized greetings, and even a pay-as-you-go option. 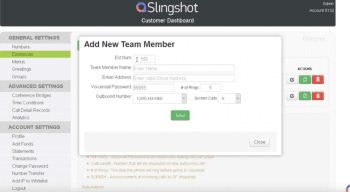 In including a variety of features, Slingshot boasts a variety of included benefits such as providing users with a local business presence in other city centers, worry-free organic technology, affordable UC services, flexibility, growth options, marketing, and more. 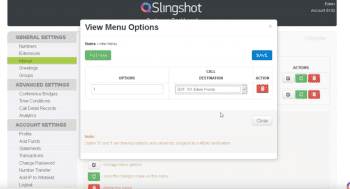 Slingshot offers users a variety of plan options, which vary in pricing and included features. As such, these plans include: Accelerator ($199/month) for mid-sized companies (10-50); Railgun ($49/month) for small businesses (5-20); Catapult ($29/month) for startups (1-10); and Ballista ($9/month) for Entrepreneurs (1-5). Again, these plans differ in their inclusions. For example, all plans (except Ballista, which include none) offer 5000 minutes per month. Also, all plans include unlimited number of extensions, departments, and custom menus/IVRs; however, offerings DO vary, too—i.e. Accelerator includes unlimited number of endpoints per extension, where Railgun includes 5, Catapult, 4, and Ballista, 3. 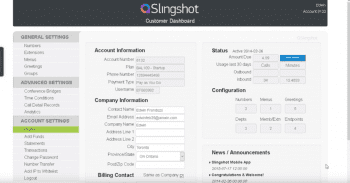 Aside from service offerings, Slingshot offers a variety of connections for users including various social media accounts and a blog. Additionally, users also have access to customer support resources such as the Support Portal—which includes Knowledge base, Tutorials, Overviews, Policies, Manuals, Configurations, Support Ticket, etc.—as well as FAQs, Live Chat, Website messaging, email, and phone. 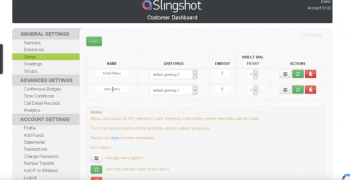 What Do You Think of Slingshot?